Do you wish to get fair, radiant glow within few minutes and in less efforts? Then VLCC Insta-glow Diamond Bleach is at your command to provide you best results. Enriched with diamond bhasma it purifies your skin and brightens skin tone. After few applications you get healthy, radiant glowing skin. It has the ability to remove tan and also dead skin cells. It has creamy texture but still doesn?t feel heavy on skin. It bleaches facial hair also. 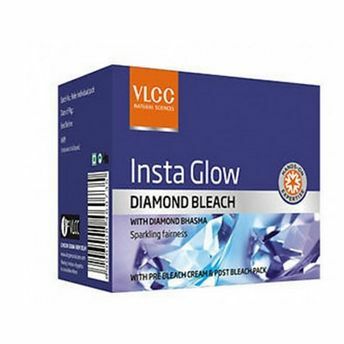 Alternatively, you can also find many more products from the VLCC Insta Glow Diamond Bleach range.